Accept Help: Be prepared with a list of ways that others can help you, and let the helper choose what he or she would like to do. For instance, one person might be willing to take the person you care for on a walk a couple of times a week. Someone else might offer to pick up groceries or even to cook for you. Focus on what you are Able to Provide: Don't give in to guilt. Feeling guilty is normal, but understand that no one is a "perfect" caregiver. You're doing the best you can at any given time. Your house does not have to be perfect, and no one will care if you eat leftovers three days in a row. And you don't have to feel guilty about asking for help. Get Connected: Organizations such as the Red Cross and the Alzheimer's Association offer classes on caregiving, and local hospitals may have classes specifically about the disease your loved one is facing. Join a Support Group: A support group can be a great source for encouragement and advice from others in similar situations. It can also be a good place to make new friends. Seek Social Support: Make an effort to stay emotionally connected with family and friends. Set aside time each week for socializing, even if it's just a walk with a friend. Whenever possible, make plans that get you out of the house. 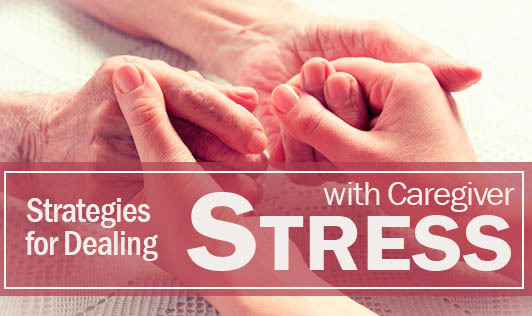 Many have identified that maintaining a strong support system is the key to managing the stress associated with caregiving. Set Personal Health Goals: For example, set a goal to find time to be physically active on most days of the week, or set a goal for getting a good night's sleep. It's also crucial to eat a healthy diet. See your Doctor. Get recommended immunizations and screenings. Make sure to tell your doctor that you're a caregiver. Don't hesitate to mention any concerns or symptoms you have.